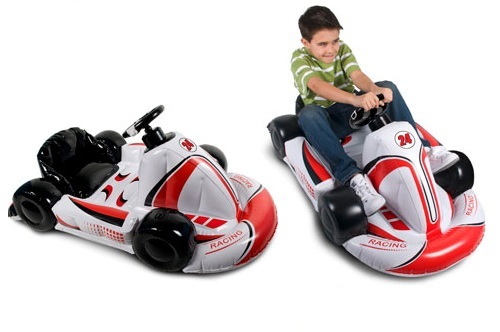 Bring the feeling of arcade racing excitement home to your Nintendo Wii. Whether drifting around corners, road racing or just speeding through your favorite racing game, you can now maneuver your way through obstacles with precision with the Inflatable Kart from CTA Digital. One of the best things about arcade racing is being able to sit in a car while your play, weather you’re a kid, or an adult, you will have fun using a steering wheel to control your vehicle. This adds another dimension to your gaming. Bringing Realism into Wii Racing games is exactly what we have done with the inflatable kart because while you’re sitting in your own race car, you can experience racing games on your Wii like never before! All you do is secure your Wii remote, with or without the motion plus adaptor connected into the center of the steering wheel to experience realistic driving mechanics. Strong and durable- Once inflated, can be played with over and over. Safe for Adults and Children- Safe for children and adults to use. Wii MotionPlus Compatible- Perfect for Any game that requires the Wii Motion Plus adapter on your remote. Integrated Steering Wheel- The Steering wheel houses Wii remote inside. Fun and innovative-Essential for Wii Racing Games. Great for your TV room, or Den-Inflatable material, for indoor use only. Strong enough for adults-Supports up to 250 lbs.